10 Minute Breakfast Menu Ideas | Audio and video stories from Southwest Washington. There are no rules against taking your breakfast to go on the run, especially compared to the alternative of eating poorly or skipping it altogether. For many however, establishing the habit of eating breakfast poses the lesser challenge than thinking up ideas of what to eat at an hour when the brain is still sleepified. Fuel up creatively by printing off my 10-minute breakfast ideas to keep on the fridge for a quick reference tool. Green Smoothie: blend the desired ingredients and pour into a portable cup for the road! Green smoothies can be frozen and thawed overnight but once this ultra-healthy habit is established as a daily habit, it will take less than 10 minutes to prep fresh and quick in the mornings. 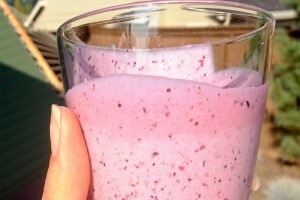 Protein Smoothie: there is no wrong way to make a healthy smoothie. Blend fresh or frozen fruit, vegetables, unsweetened kefir, avocado, raw cacao, or anything healthy your heart desires into a superb concoction. My top 2 choices of clean protein powders are Sunwarrior© sprouted brown rice protein (non-dairy) or EnergyFirst© Pro Energy whey protein (dairy based). DIY Muesli: homemade muesli can be easily tossed together for a far more budget-friendly healthy cereal than comparable packaged versions. Utilize the bulk bins at your local grocery store by bagging dried fruit such as raisins, dates, shredded coconut, cranberries and mix them with nuts/seeds and old-fashioned rolled oats. These same ingredients can be used to bake into granola over the weekend. Protein Spread On Whole Grain: spread hummus/beans, avocado, goat cheese, or your choice of nut butter such as almond, cashew, sunflower, or peanut butter onto whole grain toast or a wrap. Top nut butters with sliced banana or apple, or skip the toast and place the nut butter on an apple. Top goat cheese with sliced tomato or cucumber. Dinner for Breakfast: eating breakfast does not require that you eat traditional breakfast foods. It is better to eat what is considered lunch or dinner foods than to skip eating breakfast altogether. Last night’s salmon leftovers or a bowl of beans with avocado just might appeal more to some individuals. Eggs: any way you like them! Hard boiled (already portable), scrambled, etc. 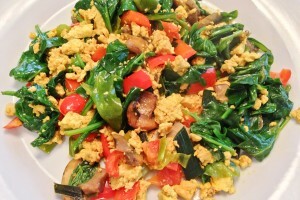 For the egg intolerant, organic sprouted tofu scrambled is a most delightful treat. Yogurt: toss unsweetened, real, live yogurt topped with fresh berries, nuts/seeds, or granola in a to-go container. Leanne’s Homemade Apple Banana Oat Bars: whip them up over the weekend or keep a supply in the freezer to thaw and munch during the work week. Overnight Hot Cereal: old-fashioned oats soaked overnight do not require any cooking time and can simply be warmed up the next morning before eating. Toss into a glass to-go container. Cut the cooking time of other hot cereals such as teff, steel cut oats, or quinoa in half by soaking them overnight before cooking or using a slow cooker. Warm Fruit Crumble: bake old-fashioned oats, chopped fresh fruit, ground flaxseed, and maple syrup together with pecans and autumn spices on a Sunday afternoon for a satiating crumble to reheat during the week. Breakfast Burrito: wrap a tortilla or pita pocket with beans/hummus, avocado, sautéed greens/veggies, canned tuna/wild salmon, or scrambled eggs. Be sure to read last week’s post on Leanne’s 10 Nutrition-Packed Breakfast Ideas!